Cremation is becoming the most favored deathcare choice in our country because of its simplicity and respectability across different cultures and religions. When a death occurs, A Sacred Moment will call you within a day of notification to set a time for an arrangement meeting. You may also Request an Appointment via our website. In our arrangement meeting, we will finalize cremation arrangements, paperwork, and payment. We will also discuss viewings, different service options, and scattering or memorial services. Please bring clothing, shoes, accessories, make-up, and/or mementos such as letters or photographs to the arrangement meeting. We can have them placed with your loved one. Pre-planning can put your mind at ease. Prior to a death, you can arrange to meet with one of our staff members to ask any questions you might have and to complete necessary paperwork for pre-planning and pre-paying for cremation. A Sacred Moment offers scattering services on the Washington State Ferry (WSF) Clinton/Mukilteo run. One of our staff schedules committal services with the ferry crew. The boat stops in the middle of the passage and the cremated ashes, held in a biodegradable “journey urn,” are respectfully given back to the waters of the Sound. Sometimes the captain will blow the horn in honor. The family is given a certificate that states what longitude and latitude the cremains were laid to rest. This is a service we provide, but families can also schedule their own committal and memorial service on any Washington State Ferry line. We can ship a loved one’s cremated ashes to family members in other regions or countries. The urn must be sent via the United States Post Office, using Express Overnight Mail, if shipping within the United States. If shipping internationally, Express International services from the United States Post Office is required. 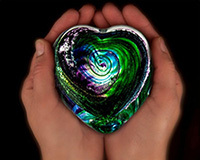 Artful Ashes capture the essence of your loved ones spirit in a swirl of color and ashes, within beautiful glass art. Created at Glasseye Studio in the Ballard neighborhood of Seattle, family members are invited to share in the experience as their glass heart is being made. Weighing just under a pound, your very own precious glass heart fits in the palm to be held close at hand and heart. While making arrangements for a cremation would be ideal in person at our office, we understand circumstances may not allow for a personal meeting to occur. We have made this online form available to you, as a way for us to support you during this stressful time and make the process of handling arrangements as easy as possible. Completing our online arrangement form does not inform us that a death has occurred. Please contact us by telephone, if a death has occurred, so we can make arrangements to bring your loved one into our care. Which is less expensive, burial or cremation? Cremation is by far the less expensive option. According to the National Funeral Directors Association (NFDA), the median cost of a funeral with cremation is $6,078, and the median cost of a funeral with burial is $7,181. What does a cremation cost at A Sacred Moment? A Sacred Moment’s fee is usually under a quarter of the national median cost of a funeral with cremation. Our affordable fee includes transportation of the body to our care facility, shelter of the body for up to 14 days, a cremation container for the body, arrangement meeting with family, completion and filing of death certificate, cremation, and a standard heavy-duty temporary container. Can we have a viewing of the decesased before the cremation? You can choose a one-hour viewing for up to 10 family members, or a four-hour viewing for up to 50 attendees. Viewings can take place in the chapel at our care facility or in houses of worship or rented facilities if there’s going to be a service before cremation. We recommend a home funeral if that is possible, so that the viewing can take place in the comfort of your own home, in familiar surroundings. Does the body need to embalmed for cremation or viewing? We normally do not recommend embalming, especially if a person is to be cremated. We assess each individual case and recommend embalming only if we feel it is necessary. How long does the whole cremation process take? Typically, our cremation process can take place within two weeks, from the time of your loved one's death until receiving their cremated remains. Circumstances surrounding each cremation are unique, so be sure to ask us about your particular situation if timing is an issue. Families who wish to have their loved one cremated right away can choose to have an expedited cremation at an additional cost. Expedited means that we are stopping our normal procedures and schedule, rush ordering the death certificate filing and paperwork, and putting your loved one’s cremation before others. Yes. Cremation requires that a body be sheltered in a combustible container before being placed in the cremation chamber. Wooden, cardboard, fiberboard, and other non-metal caskets are suitable for the cremation process. Can a person be cremated in a shroud? Yes. A body wrapped in a shroud is a wonderful choice for a cremation. The cardboard cremation container is still needed, though, to provide rigid support of the body as it enters the cremation chamber, and to provide space for any mementos and flowers. Is it possible to witness the placement of the body in the cremation chamber? Yes. A witnessed placement needs to be scheduled ahead of time, before or during the arrangement meeting. There is a room with a glass window that overlooks the cremation chamber. Families can gather in the room to watch the body being placed in the chamber, or they can be present with the funeral staff as it enters the chamber, and even push the ignite button to begin the cremation. Can we do spiritual practice or prayers near the person as the cremation is happening? Yes, you can. There is almost always time and space for spiritual practice at the beginning of the cremation. The witnessing room with a table and chairs is available, as well as the chapel. If remaining present during the cremation is important to you, we can make those accommodations. How is a cremation handled when a family has a home funeral vigil? We can transport the deceased from the home to the crematory when the vigil is complete. Families can choose to accompany the deceased to the crematory and participate in a witnessed placement. Is it guaranteed that my loved one is cremated spereately and that the ashes I receive back are actually theirs? We guarantee that all our cremations are performed individually. Each body receives a numbered stainless steel medallion that remains with that person throughout the sheltering and cremation. The identifying medallion remains with the ashes, as well. Both are placed inside a heavy-duty plastic bag inside the urn that is returned to the family. What kind of urn holds the ashes? Can I transfer them to another urn? You will receive the ashes in a sturdy, standard-sized black plastic urn. It will be labeled with the name of your loved one and the dates of his/her life on the front. Because the ashes are in an inner plastic bag, they can easily be transferred to another urn of your choice. What do most people do with the cremated ashes of a loved one? Many families keep a loved one’s ashes at home in an urn of their choice, or they scatter the ashes at a beloved spot. Some families already have cemetery plots or niches in a columbarium for their urn. Is there a prescribed way to scatter cremated ashes? Yes. There is a simple protocol for scattering ashes. Do not drop or throw the urn into a body of water, unless it is made of a certified biodegradable material. Remove the metal identification medallion from inside the urn and the identification label from the outside. Only scatter the ashes. Where can you scatter ashes on land? Cremated ashes may be scattered on privately owned land with the permission of the landowner; in national parks with permission from the chief park ranger; or on state trust uplands with permission from regional managers. Commercial entities are not allowed to scatter remains on state trust uplands. What should I know about water scattering? Cremated ashes may be scattered on all public navigable waterways in the state of Washington. These include Puget Sound, rivers, streams, lakes, and the Pacific Ocean within a three-mile limit. No reporting is required. How do I arrange to scatter ashes off a Washington State Ferry? Advance notice and booking 3-5 business days prior to a planned date is required for scattering cremated remains from Washington State Ferry vessels. Bookings are made only during specific sailing times and are not offered during holidays or on all routes. Once onboard and the ferry is underway, a member of your party should contact a crewmember who will speak with the captain. If the captain approves, your group will be led down to the aft end of the auto deck. A crewmember will accompany one person from your group beyond the restricted area to ensure their safety while the biodegradable container is placed into the water. At the captain’s discretion, the ferry’s horn may be sounded before or after the container has been released. Cremated remains must be contained in a certified biodegradable container that can be dropped intact from a ferry. Such containers are typically made of a paper product and are designed to dissolve quickly after contact with water. At this time there is no charge for this service. The only costs are standard ferry tolls. For more information or to make arrangements with Washington State Ferries for such a service, please call a staff aide at (206) 264-3556. Can I take an urn/ashes with me on an airplane? Yes. We supply a written letter stating that A Sacred Moment handled the deceased’s arrangements and that a family member is bringing those cremated ashes on the plane. The letter states which airline, flight number, destination, and date you will be flying. This letter can be shown to airport staff when you go through security. We also provide a photocopy of the Death Certificate and Burial Transit Permit. Cremated ashes should never be placed in a suitcase and checked with luggage. You do not want to take a chance of lost luggage with the airline. Can my urn/ashes be shipped by mail? Yes. We ship via USPS Registered Mail nationally and internationally. Please see Shipping Services. When someone is cremated, how do families approach funeral/memorial services/life celebrations? Is the body present? There is no set way to do things. In funerals or home funerals, the body is present. Memorial services and life celebrations follow most cremations, and many families wish to have the urn present at the ceremony. A deceased person’s body is sheltered in a combustible container. The cremation process begins with the placement of the container in the cremation chamber where it is subjected to intense heat and flame reaching 1400-1800 degrees F. After 2-3 hours, all substances are consumed except bone fragments and metals. The cremated remains are removed from the chamber. The bone fragments are pulverized and mixed with the rest of the cremains. The final cremains are a fine sand-like consistency and vary from dark to light gray or tan in color. They are placed in a designated urn or container. What happens to gold in teeth during cremation? Gold melts at the high temperatures required by cremation; therefore, dental gold is non-recoverable. What happens to prosthetic devices, such as replacement knee and hip joints following cremation? Prosthetic devices are commonly made of titanium, which has a higher melting point than the heat of cremation flames. Therefore, replacement knees, hips or other surgically implanted devices will remain intact following cremation. Unless requested by the family to be returned following cremation, these devices are recycled. Why does a cremation authorization require notification of a pacemaker? Pacemakers rely on batteries to function. Batteries at high cremation temperatures will combust inside the cremation chamber. Pacemakers, or any surgically implanted device using a battery, are removed prior to cremation. Information about the decedent is needed to complete and file the death certificate, which is mandatory for all dispositions. It’s good to look at these questions as early as possible. Some of them can stump family members, such as the decedent’s mother’s maiden name. You can fill out, print, and bring the questionnaire to the arrangement meeting. Or you can fax or email it to us. Or you don’t have to look at it at all until you’re in the arrangement meeting, where we can help you. The Code of Law in the state of Washington stipulates that the deceased’s legal next-of-kin must be the ones to sign cremation authorization forms—if the deceased has not signed his/her own before death. It is possible for you to supersede the State’s requirements of next-of-kin and legally authorize any person to be a “designated agent” – someone who will arrange your disposition for you. This is helpful if you prefer a trusted friend or more distant relative to handle your affairs. A designated agent for funeral arrangements can authorize a cremation or a burial and is legally responsible for all financial payment as well. That person’s name is written on the Designated Agent Form, and the declarant—meaning you—signs, dates, and has the document witnessed by anyone over the age of 18. No notary is required. By Washington state law A Sacred Moment must have a signed cremation authorization and release form completed, by the legal next-of-kin, before proceeding with cremation. Please be in touch should you have any questions or concerns while completing this form.